The white-footed vole is one of the least-studied (and most difficult to catch!) mammals in North America. 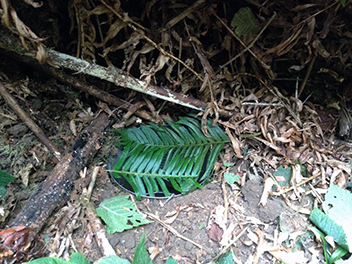 CDFW Environmental Scientist Dr. Scott Osborn, his collaborator Dr. Tim Bean of Humboldt State University’s Wildlife Department, and a small team of field biologists know that better than anyone – they spent the summer of 2014 setting traps for them in Humboldt and Del Norte counties. Designated a Species of Special Concern by CDFW, only nine records of the species were known in California prior to their study, which was aimed at determining how environmental conditions, such as climate (and future climate change), might affect their distribution. Habitat modeling by Bean (based on the previous records) identified areas with high habitat suitability for the white-footed vole. Ten study sites were chosen along the North Coast for the field study, including three where voles had been successfully trapped in the 1990s. 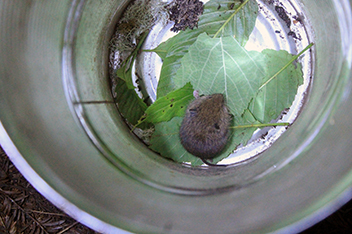 Using live traps (both pitfall traps made of two coffee cans taped together and Sherman live traps baited with oats and peanut butter), the team successfully trapped three voles. Notably, one of these was the first recorded capture of a white-footed vole in Del Norte County. All three voles were returned unharmed to their capture site after basic measurements and assessments of food plant preferences were made.